There has always been a stereotype that Geeks are creatures of enclosed spaces. They subsist off of florescent lighting, and the glow of their television and monitors. Honestly, one of my favorite comments whenever I go out into the sun is “The Day Star! It burns!”, but that’s also because I have a tendency to work nights, when it’s dark. However, Geeks like to get out and do things. Hit parks. Go hiking. Cook meat on an open fire. Play Frisbee golf with friends. LARP. You know, things that people normally do when the snow melts, and they’re tired of being cooped up indoors. Sure, it’s not a lot, but it’s more than I usually do over the summer, when I’m either at work, or I’m inside watching movies, reading the internet, or working a blog post. The thing is, just because I’m out, enjoying the Great Outdoors, doesn’t mean I don’t want to be without certain comforts. I mean, I’m going to want to Instagram selfies of me with a tree, Tweet that I’ve completed a trail, or have a fitness tracker say how far I’ve ridden my bicycle. Hey, it’s 2015. If you haven’t posted your activity to Social Media, you haven’t really done it, have you? So, with that in mind, what kind of gear do you need when you’re out and about in the world outside the confining walls of your home or workplace? Here’s some stuff I know I’d like to use! Note: The following lists are for items I would love to have, or if mentioned, already use. All links are Affiliate Links which will earn the blog a bit of change for improvements, domain name fees, convention parking, and beer and pizza costs for staff meetings. Remember, #FeedABlogger. Tech isn’t something you normally use on a bicycle, especially if you’re like me and have a tendency to fall down a lot. However, there are a few things that would make my life, and maybe yours, easier as you’re taking advantage of the bike trails around the city, or state. Handlebar Mount for Smartphone – No, this isn’t for Tweeting as I ride. Trust me, I need both hands on the handlebars when I’m on the bike. However, it would be nice to have the app up so I can see how far I’ve ridden, my average speed, and things like that. LED Bicycle Light – Bicycle lights for evening riding aren’t just smart, they’re the law. This one is nice, bright, and has a quick release so you can bring it with you when you park your bike, if you’re afraid of it getting ripped off! Ah, the bond between human and nature. Wait… is that a bird, or your ringtone? Hydration is important – Trust me, you want to stay hydrated. I’ve treated too many cases of dehydration as both a Scout Camp counselor and a Disneyland Cast Member. You can go with something as simple as a collapsible water container, or go the big boy route with a hundred ounces of pressurized water, plus a waterproof space for electronics. Power – Whether you want to share what you’re doing with the internet in the moment, or take pictures to help remember the moments later, you don’t want to rely on the battery in your phone to get you to the end of your adventures. Power options are plentiful these days, and I’ve heard good things about the Jackery line. One like this one has enough for a couple full charges on your phone, or if you’re going to be gone for a few days, there’s also this one, that provides 500-600% battery life. Also, don’t forget a cable that will charge all of your devices! Walking Stick – Sometimes, on these trails, having a bit of extra assistance doesn’t hurt. This collapsible walking stick has some solid reviews, plus it acts as a monopod for your camera! Cooking over fire is wonderful. You can cook veggies, you can cook meat, you can cook marshmallows. You can do all of this with a beverage in your hand, and with friends, and that is wonderful. 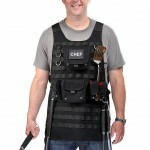 A Suitable Apron – The Tactical Chef Apron from Think Geek shows those noms you mean business. 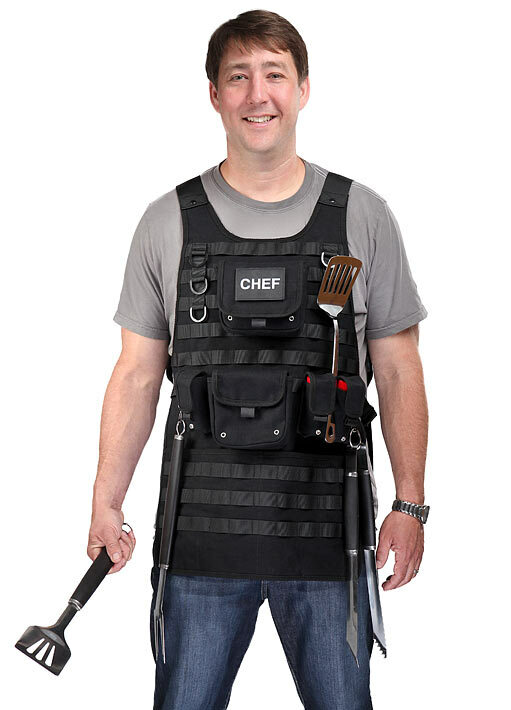 With enough pouches, clips, and loops to hold all of your condiments, tools, and rubs, this apron also looks pretty dang bad arse. Also available in Urban Camo! Star Wars BBQ Tools – For those who like to cook on the Dark Side, you can get both BBQ Tongs and a BBQ Fork that have handles like Darth Vader’s Lightsaber! Just don’t burn those hot dogs so they look like Vader! Swedish Firesteel – Now, hear me out, here. Fire is good. You need to be able to start fire when you’re cooking things. What if you don’t have matches, a lighter, magnifying glass, or a 9 volt battery and steel wool available? A tool like this, when used correctly, can and will help start a fire. To my understanding, the sparks can also be used to light a gas grill. These are a few things that I’ve found online that I could make a few pennies off of thought you all might like. Let me know if you know of anything that helps enhance your Geeky experience outdoors!